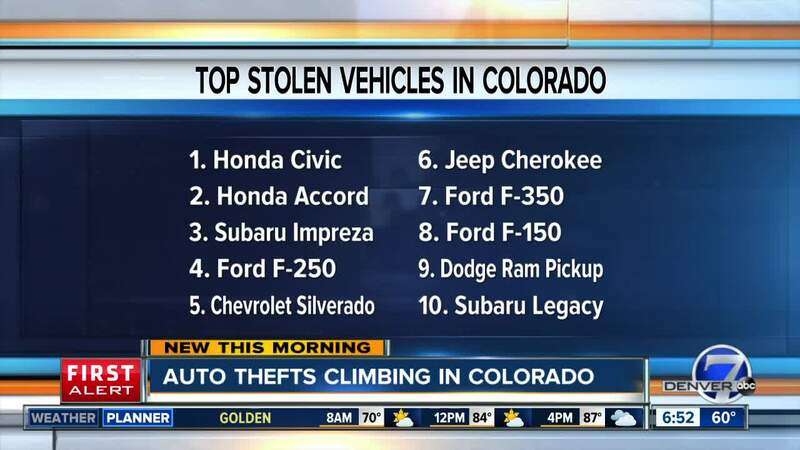 Auto theft has more than doubled in recent years in Colorado, according to the Rocky Mountain Insurance Information Association. On average, more than 350 vehicles are stolen in Colorado each week, according to RMIIA. July is Auto Theft Prevention Month and experts are trying to get out the word that drivers need to do everything they can to prevent themselves from becoming a victim. "If you think this is a victimless crime, numbers tell us otherwise," said Carole Walker, with the RMIIA. "You're not safe depending on neighborhood you live in. Thieves are looking for easy steal — just cruising through neighborhoods." Walker said drivers need to lock their cars, not leave them running and avoid leaving a spare key in the vehicle. A 2016 study Talmey-Drake found 34 percent of Coloradans admit they have left their car running unattended. To see how many car thefts have happened in your neighborhood, you can check out a map that tracks thefts .